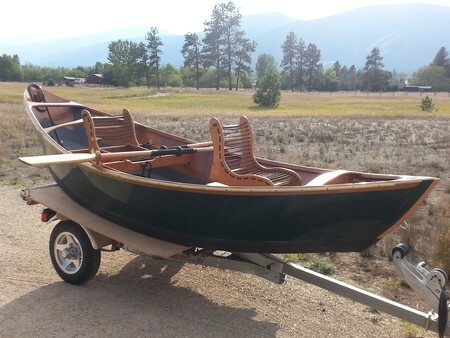 Handcrafted custom drift boat by Jason Cajune of Livingston Montana. Lightweight composite construction (wood sheathed in fiberglass) with bedliner coating on kevlar-honeycomb floor and underside. Seats are oiled wood and rope, with swivel passenger seat. Straight-line anchor system with bronze block pulleys. Bronze rub-rails and heavy-duty bronze oarlocks. Nimble and stable, its a perfect two-person boat for the Wests great rivers. Well-cared for and always stored inside with cover and in excellent condition. Includes two custom-wrapped wooden oars, anchor, and custom cover. 2011 list-price was $7105 as built, so you can save money and still enjoy this beautiful boat right now.